America's Serena Williams Cliched 7th Wimbledon Tennis Tournament title and the 22nd Grand Slam singles title of her career on Saturday (09.07.2016), after defeating Germany's Angelique Kerber 7-5, 6-3 in the Wimbledon women's singles final in London. The 34-year-old Serena Williams equalled the Open Era record of Steffi Graf for the highest number of singles majors. Serena and her sister Venus Williams will also wins in the women's Doubles Championship for a sixth time, they beat the pair of Hungary's Timea Babos and Kazakhstan's Yaroslava Shvedova in 6-3, 6-4 on Centre Court, a few hours after Serena won her seventh Ladies’ Singles title. It was their 14th Grand Slam doubles and placed second with Gigi Fernandez and Natasha Zvereva in for the most major doubles titles in the Open Era, behind only Martina Navratilova and Pam Shriver, who claimed 20. Serena Jameka Williams born in September 26, 1981 is an American professional tennis player. The Women's Tennis Association (WTA) has ranked her world No. 1 in singles on six separate occasions. Serena Williams holds the most major singles, doubles, and mixed doubles titles combined amongst active players, male or female. Her record of 38 major titles puts her fifth on the all-time list and second in the open era: 22 in singles, 14 in women's doubles, and two in mixed doubles. Serena Williams total of 22 Grand Slam singles titles is tied for second on the all-time list behind Margaret Court and tied with Steffi Graf for the most in the Open Era. She has won 14 Grand Slam doubles titles with her sister Venus, and the pair are unbeaten in Grand Slam doubles finals. Williams is also a five-time winner of the WTA Tour Championships. 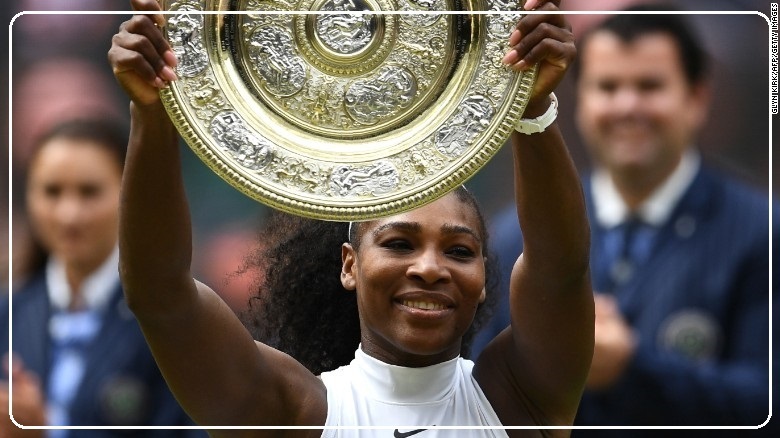 Serena has also won four Olympic gold medals, one in women's singles and three in women's doubles, an all-time record shared with her sister Venus Williams. Williams was the highest paid female athlete in 2016 earning $11.6 million in prize money and $13 million from endorsements. In December 2015, she was named Sportsperson of the Year by Sports Illustrated magazine.